APM Terminals Mumbai has adopted ‘Direct Port Delivery’ service initiated by the Indian government as part of its “Ease of Doing Business Program” to enhance India’s access to the global logistics chain. The new protocol can result in substantial savings of time and money for importers by reducing container dwell times after vessel discharge. “We are committed to support ‘ease of doing business’ initiative the Government of India has championed. We were among the first terminal operators in India to offer Direct Port Delivery service in 2006 and since then have continued to support the reforms and initiatives of the Indian Ministry of Shipping and JNP, as well as the Jawaharlal Nehru Customs House,” Kamal Jain,CEO, APM Terminals, Mumbai, said. APM Terminals Mumbai is a joint venture between APM Terminals and the Container Corporation of India (CONCOR), operating from Nhava Sheva’s Jawaharlal Nehru Port (JNPT) and represents India’s largest container terminal. 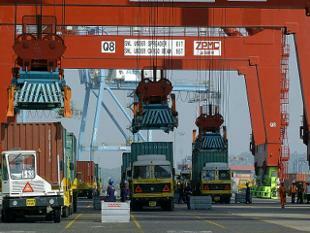 The terminal handles the highest DPD volumes at the Jawaharlal Nehru Port. In the past, import containers were sent to Container Freight Stations (CFS), 1-1.5 days after arriving by vessel. Next, depending on the completion of import procedures and clearances with shipping lines, custom house agents, customs, consignees and CFS operators, the cargo was then delivered to the end user after an average dwell time of 9-10 days. With DPD, importers can avoid these obstacles and import containers can be delivered to the end user directly from the port with an average dwell time of 1.5 days. “We have introduced several trade-friendly services ourselves as well to improve ease of doing business. This includes initiatives such as Paperless Transaction, delivery of import cargo within six hours of vessel discharge, RFID tracking, Inter-terminal transfer through virtual gates, integrated rail sidings and improved gate turnaround times. We are working closely with customers to introduce other new services as well,” said Ravi Gaitonde, COO, APM Terminals Mumbai. To enable greater efficiencies in the overall transportation and logistics supply chain, the Indian Central Board of Excise and Customs, merged the ‘Accredited Client Program’ with the recently introduced ‘Authorized Economic Operator’ program. This resulted into extension of the DPD service to small and medium scale importers, who account for a significant portion of India’s world-leading GDP growth of 7.6% in 2016. Containerized trade has expanded at a compound annual growth rate of approximately 10% percent over the past ten years in India, and is projected to continue growing at a similar pace as India undertakes infrastructure expansion projects. Jawaharlal Nehru Port, serving Mumbai, is India’s busiest container port, accounting for 44% of all India’s containerized cargo traffic of 10 million TEUs in 2015. APM Terminals Mumbai is a joint venture between APM Terminals and the Container Corporation of IndiaBSE 0.57 % (CONCOR), operating from Nhava Sheva’s Jawaharlal Nehru Port (JNPT) and represents India’s largest container terminal. 2016 volumes at the terminal stood at 1.8 million TEUs, down 6% from 1.91 million TEUs in 2015 and dwell time decreased from 3.12 days to 2.45 days, according to international shipping and logistics news website JOC.com.